Spoiler-y mcspoilspoil time. ;) - You don't know me. So, heads up, my guess is if you haven't watched LOST and you want to avoid spoilers as you want to see it on your own, etc that you won't want to read the comments here, because I want to do an open LOST forum. Oh and, a caption contest. ;) Even more props if you can somehow make this LOST related. Is there a 'furry' equivelent to people that like to dress up as nature things? Is she going to hook up with somebody who's all dressed up as a sun..or a cloud? LOL! The idea kind of terrifies and amuses me all at once. [To the tune of I'm a little teapot] I'm a pretty peacock short and stout. I don't watch Lost. Sorry! And no worries. I just wanted there to be a place for fans to chat about the finale. 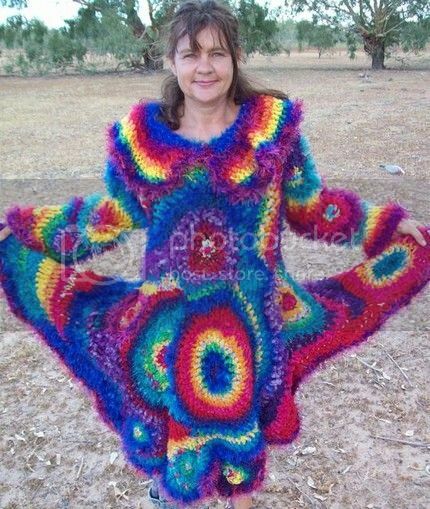 Wow that is a crazy rainbow crochet dress! Exactly!!! lol. I know there were some questions left unanswered but overall I think they did a really good job. Left me crying a few times. lol. And I like that there were still questions. I would have been bored if they had spoon fed me everything. "Mrs.Johnson proudly displays the product of her 'Crotcheting for the Bind' class." Lost fan displays topographical map of the lost island chain. I don't watch Lost, but DAMN that outfit is wild! No rush about Lost `cause life is very-very similar to it - nothing is clear. So - what fun to watch Lost? Don`t I know that no one can understand life?) Xena & House are more clear & heroic, they`re somewhat better) That`s my opinion. I used to love Xena. Especially the musical episodes. I was so sad to hear that the actor who played Ares died. I thought he was fantastic on both that series and Hercules. -- And I've liked what I've watched of House. I think the reason I liked LOST so much as that the characters weren't heroic in and of themselves, but were able to find that within them to help themselves and those on the island. I like it when characters aren't just clear cut. I think it's because I'm an actor and it's a lot more compelling as far as acting choices go, for me when I'm watching. :) I can't seperate that part of myself very easily. It's technically for the entire 6th season, but if you scroll down, you'll find commentary on the finale. My boyfriend is Dave aka Papercut. Dave totally has a different view of the ending of the show too. You rock, thanks babe. I'm going to peruse these. ;) I love the conversations people have. What happens to the smoke monster when he accidentally gets stuck in the wash with the brights? The latest in Hypercolor fashion for 2010: Sweater Dresses! Now everyone can know when you've peed yourself. The dress reminds me of something my grandmother would buy for a dollar and try to give it to someone because it was such a bargain. She got neon multi-colored onesy for my kids. One of them has a picture of 2 native American Indians making smoke signals and on the bottom says “come black”. My mom says she thinks they misspelled back. I bet they did misspell it. and lol, oh dear. Are you sure we're not cousins? That kinda sounds like my Grandma. In general, I really liked the finale of Lost. I sort of wish the final meeting place for the Oceanic folks wasn't a church, though I don't know how else they would have gotten Christian into it. But I thought in the big picture it was a nice way to end the series. I sort of wish there was a slightly clearer answer to "what would happen if the island wasn't protected" - was it an apocalyptic thing? the Island remains REALLY vague, though I guess if they tried to be more specific they would have disappointed lots of people, since it is up for such interpretation. I'm wondering why Desmond seemed to know about the Sideways world when he was alive...but not enough to know that it was Jack who saves the Island. Yeah, it was weird not to have everyone there though, wasn't it? I mean I know some of the actors had issues and couldn't come back, but it still felt strange. I loved it overall though, and sobbed. lol. And yeah, they were REALLY vague, but I kind of like that. It lets the audience decide those things for themselves. I wish we would have had more Desmond and Penny at the end. Love the dress, LOL!! WOW! Unfortunately, I've never had the pleasure of watching Lost, so I can't comment.